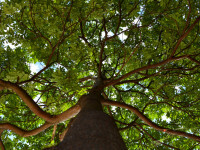 National Arbor Day is April 24 this year, so take a moment this Friday to celebrate trees. And there’s a lot to celebrate when it comes to trees! They offer cooling shade, make our neighborhoods more beautiful, and shelter wild creatures, like birds and squirrels. They also provide us with products we need, such as wood, mulch, fuel, and paper. There are lots of ways to honor trees and all they do for us. Start with the ideas that follow and then visit the Arbor Day Foundation website to learn more about Arbor Day and things you can do to celebrate it this year. —Plant tree seedlings. You can also take part in local tree planting events in your community. Check online for Arbor Day programs in your area. —Learn about all the benefits of having trees in your neighborhood. —Take a hike or walk and try to identify the trees in your area. If you need a tree identification guide, check for a guide in your local library or visit the Arbor Day website. —Make your own paper from scrap paper! For instructions, read Recycle Paper by Making Your Own.